The past month has been a busy time for Dr. Franklin, and typically diverse. There were the less “historical’ events where Benjamin Franklin is present because, well, it just isn’t Philadelphia without Ben Franklin. Along with Thomas Jefferson (the wonderful Steve Edenbo), I welcomed the new students at Thomas Jefferson University. I greeted Hummel collectors and Democratic delegates, both local and national. I particularly enjoyed a wedding rehearsal cocktail hour with a bride and her parents and her mother’s fourteen siblings, the delightful O’Brien clan. In a more historical context, I greeted members of the General Building Contractors Association and the members of the Carpenters Company in Carpenters Hall. The Carpenters Company dates to 1724, and their lovely Hall overflows with history. It was also my pleasure to spend a few hours in the Benjamin Franklin Museum in Independence National Historical Park, and to share stories with visitors. On another day, I met up with my friend Dave Loda, aeronautical engineer and also the official Nathaniel Greene at the Greene Homestead. Dave brought a group of seven engineers from China, and I gave them a tour of the historic district and shared lunch at the wonderful City Tavern. Twice in the past weeks I have had the pleasure of giving presentations as Benjamin Franklin to senior groups, my favorite audience. I spoke to a fine group from upstate New York, and a lively group from the Shiloh Missionary Baptist Church in Pittsburgh. What fun that was! 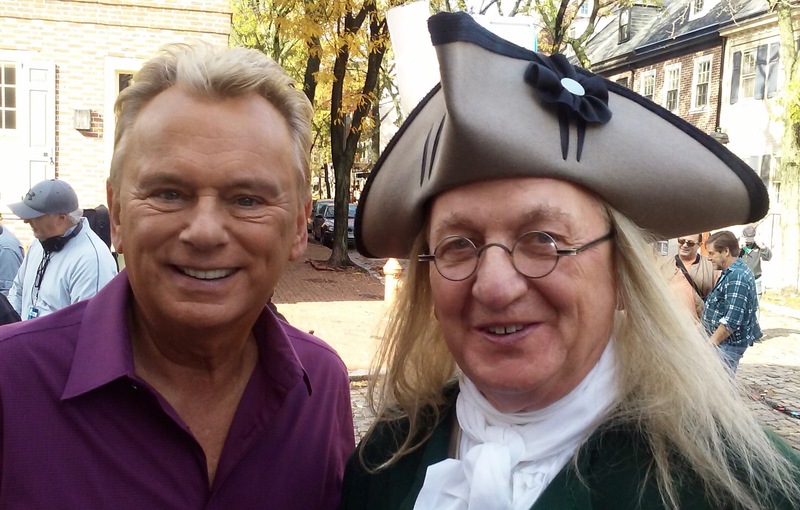 Finally, as I write this, tomorrow I will be with Pat Sajak and Vanna White in Headhouse Square in Philadelphia, as we welcome Wheel of Fortune. As you can see, it is never quite the same. Vive la difference!